Thinking is an ongoing process that never ends, whether it is for some creative stuff or it's a devil's work; poor brain never takes a pause, no halt, no rest, no peace, no sleep even when you think it is sleeping (In real, your brain is always functioning, and that's why you suddenly shout amidst dark nights after seeing a lady in white with inverted feet and scary eyes; hehe...if it was sleeping, there would be no dreams. ;)). This thinking robot has eternal powers to work for hours together unfatigued, but that doesn't mean it's never tired. It also needs to relax, chill-out and have a good time, by which I simply mean release of some 'endorphin', the happy hormone in your body. For me, I have it in abundance, flooding out from my eyes and with each smile, every time I cook. And then there are certain recipes, some cuisines, some delights that make you even more ecstatic and jovial when you work with them. 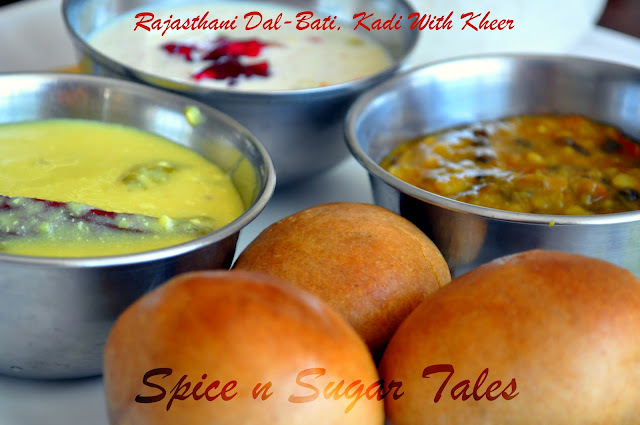 One out of such convivial culinary experiences is when I make this authentic Rajasthani Platter with the utter flavorful 'Dal Baati', and 'Kadi Chawal' ( For sure the element missing here is 'Choorma' and for now I'm replacing it with 'Kheer'). 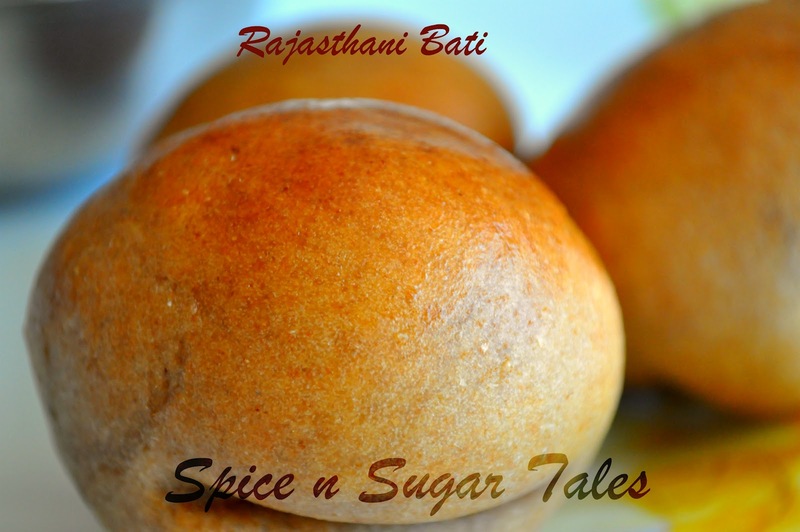 Baati (Rajasthani: बाटी) is a hard, unleavened bread cooked in the desert areas of Rajasthan and Gujarat. It is prized there for its long shelf life and high nutritional content, as well as the minimal quantity of water required for its preparation. 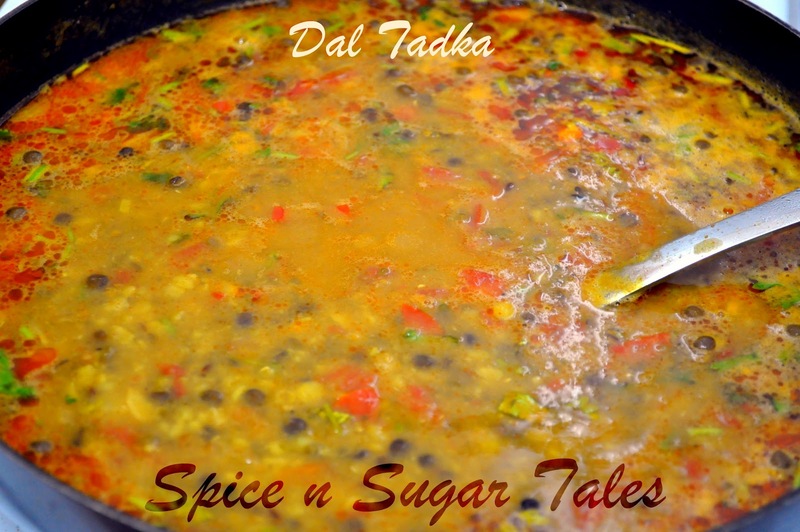 It is always eaten with dal. Bati is also known as litti. Litti can be enjoyed with Chokha (a type of spicy mashed potato mixed with roasted brinjal). Litti and chokha are synonymous with bread and butter in many parts of India. 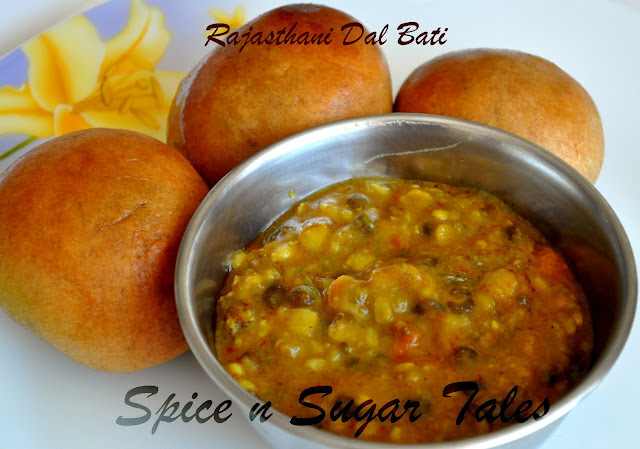 Dal Bafla, or Dal Bafle, is a central Indian variation made which is boiled in water before being roasted, it is much softer and more rich in ghee than Baati as the ghee penetrates inside . Baati is also eaten in southern India, mostly by the people of the lambada community, but this form of baati is different. It is made up of jowar and is harder than the wheat bread. It is also eaten with dal, though any curry goes fine with it. Ghee is served along with the curry. Though at home my mom always makes it with Urad Dal, but I prefer going for Panchmel/ Mixed dals to shoot the nutrient content and diversity. Soak the dals/lentils for 2-4 hours. Then pressure cook them with the turmeric powder and salt for around 15 minutes on medium to sim flame, till they go tender, and not very mushy (like how you boil the dals on a regular basis). Take a wok/kadai and heat oil in it. Once hot, throw in the cumin seeds/ jeera and wait till they splutter. Now push in the asafoetida/heeng. Immediately add chopped onions and fry till light golden on medium flame. Then add in the ginger garlic paste/ chopped garlic pods and fry for 2 minutes. Now sprinkle the spices onto it and cook for 2-3 minutes. Add in the chopped tomatoes and continue cooking till the oil separates from the corners and the tomatoes go all mushy and done. Now transfer the boiled lentils into this and give a smooth stir to blend them all. Shower a pinch of garam masala more followed by the chopped coriander leaves and cover the wok/kadai. Cook covered for a minute and put off the flame. Keep it covered. Take the atta/ whole wheat flour in a wide open dish and add salt and carrom seeds/ajwain to it. Now add the ghee/ clarified butter and mix it well. The texture should be crumbly. For the perfect one, we normally check by taking a handful of the flour and closing the fist tightly, then leaving the flour gently down and seeing that it doesn't scatter immediately. If it does, add in a little more ghee. The Ghee should be melted. Now make a smooth, firm dough with it using water. The dough is not as soft as we make for roti/chapati; it is slightly hard and firm here. Cover it with a wet cloth and keep it aside for 10-15 minutes. On the other hand, keep the dal for boiling. Also, pre-heat the oven to 250 degrees Celsius for 10 minutes. Now, till the oven is getting heated and the dal boiling, chop the vegetables in the mean time. Once the dough is ready, knead it well with little ghee on your palms. Then divide it into 8 equal parts and make a round ball with each part and flatten it slightly. Shift them to the oven (on the grill plate) and bake at 250 degrees Celsius for 20-25 minutes with both rods (above and below) on, till the top goes slightly brown and hard. My oven took 20 minutes, but your oven timing may vary. Bake for extra 2 minutes if you want them to be hard and crunchy. Now prepare a plate with a bowl of dal/lentil curry, 1-2 ghee-dipped baatis, a spoonful of green mint chutney, some garlic chutney, chopped onions, a roasted papad, a glass of butter-milk or kairi pani(raw mango squash) and vroooom...there you go. I also love having them with some 'Kadi Chawal' i.e. Chickpea Flour Yogurt Curry with Rice and then some Kheer/ Milk Pudding! The authentic dal is made just with the black grams but you can use the lentils based on the way you wish. 'Choorma' is an intangible part of this meal, which makes it even more delicious and sweet. I have replaced 'Choorma' with Kheer/ Milk Pudding here because I was running short of time then, but for sure, Choorma will add in very soon to the food list. The ghee used in the whole process should be the melted one. Baatis are authentically made in a tandoor, and our oven is just a variation to that. The real art lies in getting the right texture for the baatis. They should be crusty and hard outside and soft yet crumbly within. The more time you donate for baking, the harder they go, so be careful with that. Don't think twice before pouring in the ghee else you miss the real taste. Also, ghee helps in keeping them moist and soft, which is pretty necessary here else you end up eating crumbly, dry mixture. Normally, we crush the baati to small pieces, add in ghee, dal, chopped onion and chutneys, and then enjoy with hands rather than spoons (and I still do that :), though it is slightly uncommon these days. great work...though now you got me scared about closing my eyes! (just kidding)...your thali took me back to our time in jaisalmer(8 years back),there was a restaurant there that used to serve pretty much the same thing(dal,bati,kadi,chawal,kheer and churma)!superb! awesome meal..this is so so good n perfect one..
Wow....awesome recipe!!! I have always wondered abt this dish....thanks for simplifying it !!!! OMG Rajasthani platter looks soooooo inviting and yummy. My favorite too. You have explained the recipe very well. Thanks Anjali. Will definitely try this soon. My favorite of all the rajasthani foods! Your dish looks very tempting. What a great platter............feeling just soooo hungry looking at this . Thanks for the detailed recipe. 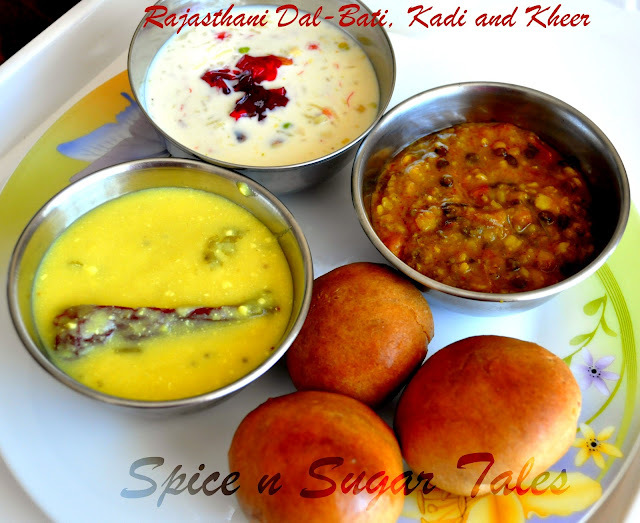 wonderful combo dear, platter looks so yummy...never tried any rajasthani food ..
thanks for this wonderful entry! lovely and delicious platter ! This Bati is totally different,love that combination. Yummy! 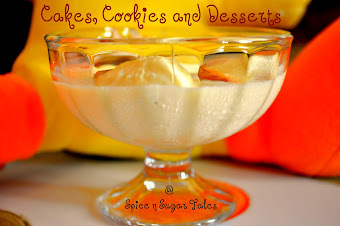 Wonderful and yummy one !! Thanks for linking to the event !! Thanks for the nicest words on my space. happy to follow you back. the dal bati looks super inviting. U know wat, my mum also makes it with Urad Dal. Infact I have never got any one making it with Urad dal apart from her.. And now u off course :) Love these small bites.. A very healthy and tasty dish it makes. suppurb one... i tried.... and it is just fantastic!!!!!!!!!!!!!! !